India has withdrawn a controversial tax on sanitary pads following a vocal campaign led by activists and Bollywood stars to boost female education and empowerment. Saturday’s announcement is part of a slew of changes to the national goods and services tax (GST) intended to reduce the prices of around 90 key consumer goods, many of which target urban middle classes ahead of next year’s general election. “I think all women will be happy to know that sanitary pads will now have 100 per cent exemption. There will be no GST on sanitary pads,” India’s acting finance minister Piyush Goyal told journalists on Saturday. Activists, Bollywood actors and some politicians had opposed the 12 per cent tax, citing a lack of access and affordability for a key hygiene product as a key barrier to female empowerment in the country. 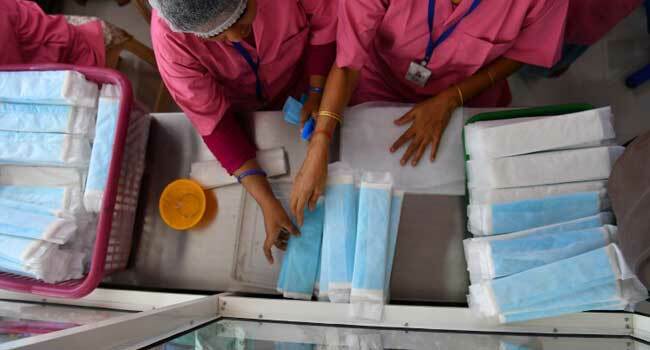 A national survey report released earlier this year said around 60 per cent of young women aged between 16 and 24 years did not have access to sanitary pads. The figure was as high as 80 per cent for some of India’s poorer central and eastern states. Reports in the last few years have linked absence of basic infrastructure such as toilets at Indian government schools outside big urban centres, and lack of access to sanitary pads, with higher dropout rates among girls. “One of those days when a news brings tears of joy as a cause close to our heart gets fulfilled,” Akshay Kumar, one of Bollywood’s most popular stars, wrote on Twitter. Kumar was the lead actor in Padman, a Bollywood movie released earlier this year about the life of an activist who created a line of low-cost sanitary napkins for rural India. “Thank you … for understanding the need for menstrual hygiene and exempting sanitary pads from tax. I’m sure crores (tens of millions) of women in our country are silently sending gratitude ur way,” he added. The new national GST (goods and services tax) was introduced last July under Prime Minister Narendra Modi and was the country’s biggest tax overhaul in a generation. It was meant to unify the over $2 trillion economy into a single market, with four tax rates of 5, 12, 18 and 28 per cent.